After Marseille, Forcalquier, Avignon, and Châteauneuf-du-Pape (aka Mecca), there were two remaining stops on our Provence road trip; Arles and Cassis. It's a sultry little city with a Spanish vibe (probably due to the bullfights). And it's hot as hades (just how I like it). A sign posting the place where Van Gogh had setup his easel and painted one of his masterpieces. A boring building. And cars. Bummer. Nice! Haven't been down to Arles yet but feel like I took a small trip there this morning through your photos..& I'll remember to be on the lookout for that wild-man Van Gogh..Thanks for sharing! It is a nice little city. We're thinking about heading back for a weekend to see more of it. Four hours wasn't really enough time. And because of your last post on Italy, we're probably going to San Remo in November. Thanks! I loved Arles and we stayed at Le Calendal just next to the arches of the Arena. It has a beautiful cloistered garden where we enjoyed our breakfast. Hummmm.... need to go back! Haha thanks for calling my countryman a lunatic...but yes he was ,lovely post. never noticed those signs in Arles. But they have something similar in St. Remy de Provence, and if I remember correctly, the view is more similar to the paintings. And yeah, did you warn The Husband ahead of time? 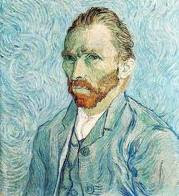 Love the caption under the Van Gogh portrait haha. It is a shame that the view was different once you got there! I would really like to travel. Aggh. You know - I think I learn more about fabulous places to see in the world from these fun blogs than any other source (OK, I could watch that Silver Fox Tony Bourdain all day long). But the real stories from (especially) the ladies keeping it - well, real. Love it. Thank you for sharing! Oh well, at least Van Gogh wouldn't have heard the traffic if he popped by!